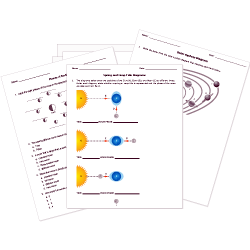 You can create printable tests and worksheets from these Grade 1 Astronomy questions! Select one or more questions using the checkboxes above each question. Then click the add selected questions to a test button before moving to another page. The Sun gives us . Earth only has one moon. When the Moon passes exactly in front of the Sun it's called an eclipse. It is when the place you are on Earth faces the Sun. The Sun is our closest . What is the name of the galaxy where Earth is? A moon is a big moon. It takes Earth 1 year and 365 days to orbit the Sun. Which of these happens because Earth rotates? How hot of a planet is Venus? We only see one side of the Moon.